Home – a place to call yours, a sanctuary often also used for work and play. We all want that perfect space to call ours, to live within and enjoy life. This round of Collabor88 has that utmost importance of living in mind. Especially true are the exquisite offerings from Scarlet Creative and Apple Fall. 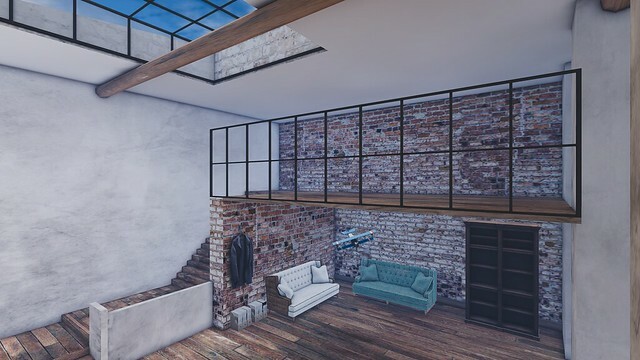 The Work Life Loft from Scarlet Creative is just that perfect space to live, work and have a grand time! Fill it with whatever you desire, any type of style will do, for its your space to do as you place. Spacious it is, with a great deal of open space and natural lighting, the creative possibilities are truly limitless. Fill it with the extraordinary decor from Apple Fall you have come to love, new additions have a feel of whimsy and a bit of the masculine and they are just perfect for this lovely abode. Available now @ Collabor88!